Journey Cuisine of Denver, Colo., is recalling approximately 28,064 pounds of pork and chicken burritos and wrap products. 8-lb. 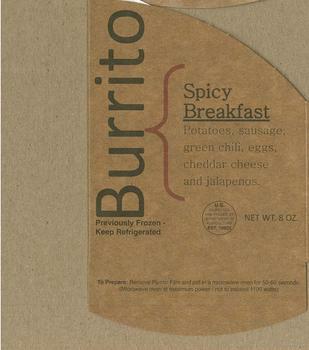 case containing 16 frozen burritos of “KING Soopers BACON BREAKFAST BURRITO” with “Sell By” dates from 03/11/18 to 4/26/18. 8-lb. case containing 16 frozen burritos of “KING Soopers CARNITAS POTATO BURRITO (Burrito Carnitas Caliente)” with “Sell By” dates from 03/11/18 to 4/26/18. 8-lb. case containing 16 frozen burritos of “KING Soopers CHICKEN QUESO BURRITO” with “Sell By” dates from 03/11/18 to 4/26/18. 8-lb. case containing 16 frozen burritos of “KING Soopers SPICY SAUSAGE BURRITO (Burrito Spicy Breakfast)” with “Sell By” dates from 03/11/18 to 4/26/18. 4-lb. case containing 8 sandwich kits of “SHAMROCK FOODS GRILLED CHICKEN WRAP” with “Use By” dates from 9/16/17 to 10/31/17. The recalled products, bearing establishment number “EST. 19822” inside the USDA mark of inspection, were shipped to retail locations in Colorado, New Mexico, Utah and Wyoming. Consumers with questions regarding the recall can contact the company at (866) 596-2385.